We are thrilled to have our friend Eric Waldo, Executive Director of the Reach Higher initiative, share his experiences with his mentee, Verlando Brown. Eric shares insights on how mentorship reaches beyond higher education and can open doors and opportunities that once remained locked. We are grateful Eric shared his personal journey of mentorship and how investing in others can forever change your life. Thank you for inspiring us, Eric. He lends his expertise in the questions below. Get ready to be inspired! I’m the Executive Director for the Reach Higher initiative, which started during the Obama White House, and continues on today as a nonprofit. Our mission is supporting and encouraging students to pursue and complete their education past high school, whether via a two-year degree, a four-year degree, a community college, or an industry recognized certificate or credential. 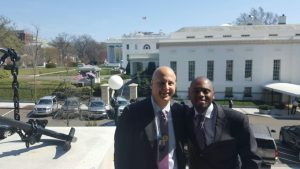 In 2015, a fellow White House colleague put me in touch with a young man, Verlando Brown, who was organizing a conference in Baltimore to support first-generation students in the Baltimore community. Verlando shared with me his story as the first in his family to go to college. In fact, at the time, Verlando was completing his master’s degree—another first for his family. Verlando also shared the struggles he faced growing up in urban Baltimore as the child of a single mother. He was open and honest about feeling like he didn’t have enough positive male role models in his life, and he asked me if I would be his mentor. It was the easiest decision of my life. We started setting up monthly check-ins and arranging times to meet in-person for lunch. Because Verlando’s story so resonated with my work, I asked him to share his story at the White House at the 2016 Beating the Odds Summit, where we hosted first-generation students from around the country. I wanted the rising freshman in the audience to learn from Verlando and see the possibility of success based on Verlando’s own persistence and lessons learned. And I wanted Verlando to understand that his experience and wisdom was worthy of attention from the highest office in the land. He still supports the work of Reach Higher to this day, and we brought him to speak to students this past summer in Washington, D.C. who were transitioning to college. There are also the little things you can do for your mentee. I even got Verlando into the White House Mess for his birthday lunch! Students can have trouble navigating their student experience successfully to their career, especially first-generation students. If you didn’t grow up in a family, school, or community where going to college was the expectation, it can be hard for students to find peers to show you the pathways and provide tips that so many of us take for granted. 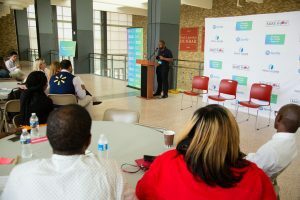 I think it’s more than just helping them graduate and finish school—it’s about helping them navigate the career side after college or after graduate school. Upper income peers can easily ask their parents or their parents’ friends for connections to help open the doors of opportunity. By finding a good mentor, at-risk and first-gen students can get the keys to some of those same doors. 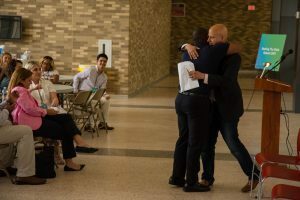 When Verlando was graduating from his master’s program, I was able to connect him with a local dean of a university, and I helped him land his first job. My network became his network. So a great mentor helps a young person see what’s possible and share the keys to those doors of opportunity that can seem locked for too many low-income students. Just ask. Verlando asked me to be his mentor, and I said yes. It was that simple. But of course, finding someone who is in a field you care about or someone who has relevant experience to what you want to do with your life always helps. But at the end of the day, you just need to find someone who really is interested in investing in you. Eric Waldo is the Executive Director of Michelle Obama’s Reach Higher initiative at Civic Nation, whose mission is to support and encourage students to pursue and complete their education past high school, whether at a professional training program, a community college, or a 2-year or 4-year college or university. Waldo earned a J.D. from the University of Chicago Law School, an M.Ed. from Harvard University, and an A.B. from Brown University. He currently resides in Washington, D.C. You can follow Eric on Twitter@ewwaldo.